Or maybe there was warning and i just don’t pay enough attention to such things. I found out this was released by a notification on my phone saying it had downloaded in the night. Making furniture all day at work didn’t bode well for a chance to play and i had to wait until i got home. Many people are wondering the same as myself if this new release will be a saving grace for Bethesda. In my opinion…kind of? Here is a brief overview of my experience with the game. The main screen has a live background. Starting with the Main Screen, this is easily the most recognizable picture we have seen prior to release. Hey. Rebuild this. By Yourself. This is the area for crafting and leveling your town hall. There are aspects in this game that mimic many mobile city games, from the leveling of workshops by town hall level to using gems for speedup timers. 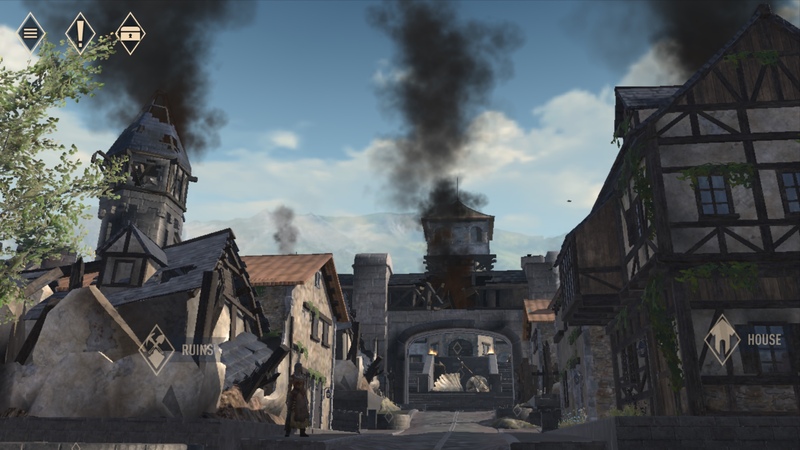 NPCs walk around the town and will converse with limited conversation trees. Controlling the first person character towards the NPCs was strange at first but once i got the hang of it, it worked quite well. In portrait mode, the controls are tap to move and swipe to look around. In Landscape the bottom corners act like joysticks and became my favorite mode of travel. 5 skulls means Git Gud. The questing system is reasonably well done. The Quests started off pretty easy. Then they got difficult. Then really difficult. Challenges award crafting materials and gold, most of all they refresh frequently. If you get stuck, the jobs board gives smaller easy quests to grind it out until you can make better stuff. Or until you level up. Right off the bat this was one of my favorite parts of the game. 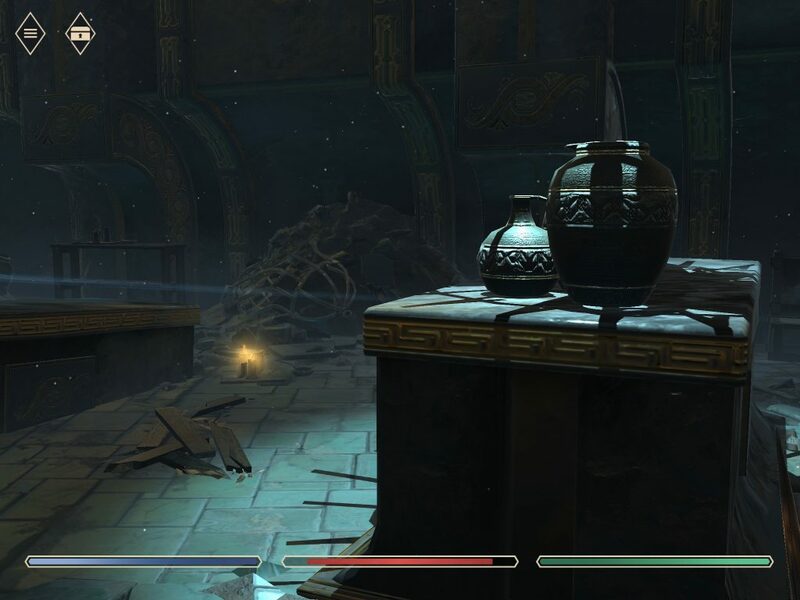 An endless descent battling through goblins, spiders, mercs, and other Elder Scrolls baddies. You start with full health, and there won’t be any skeever tails around to munch on along the way to heal. After level 5 it applies a multiplier which increases after each round increasing gold and XP. After a new max level is reached the max multiplier starts at a higher level. If you need quick XP early on, and if you’re geared up decently this is a good option. There are no tickets so you can run it as many times as you want in a row. One of the decisions i appreciated with this game. Classic beer goggles graphics. Looks amazing…from a distance. This area is not yet available, which i don’t mind. There’s so much to do with the rest of the game there really isn’t any down time if you don’t want it. No bows, staffs, or other ranged weapons are available (yet?). This was the part that i had the most questions about. Outside of not having a full crafting tree/system in the game, i don’t hate how they did this. Materials are automatically stored and available for use whenever. This saves a ton of space for weapons and armor. 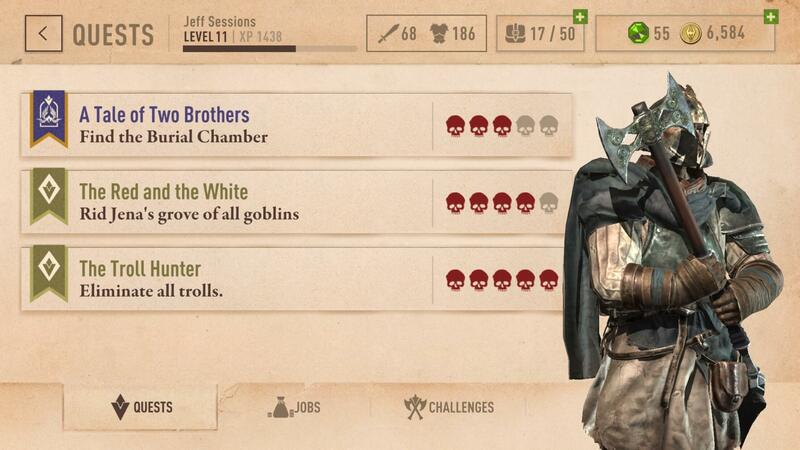 For the record and politics aside, I made a wood elf and named him Jeff Sessions because they didn’t have gnomes and i think he looks like a gnome. Poor joke? likely. This all works basically the same way it does in Skyrim. However your weapons and armor take damage over time and need to be repaired. This is relatively cheap and they don’t take damage very quickly. I usually don’t like that game mechanic, but here i didn’t mind. The mobile version of enhancing is called tempering in the game. When tempering, be careful to check which level you are tempering up to. More than once i just mashed the button and accidentally only improved it one level instead of the 3 or 4 i may have been capable. 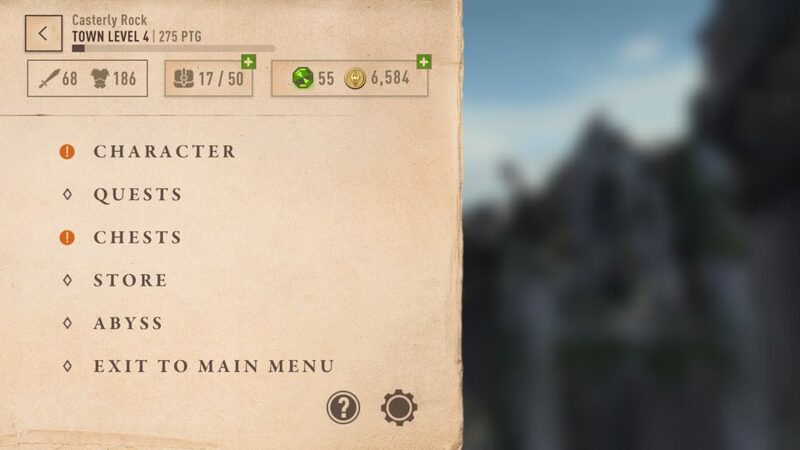 The in game menu allows for good connectivity to other areas which is a nice feature. Bahfuck. That’s not a word, but bahfuck. The chests and the build times…I don’t like the chests and the build times. Yeah, it’s a mobile game and there has to be a financially driven component to the game, but speeding up anything after your 2nd house is a bit expensive. I did make a purchase of the special starter pack, it provided a decent amount of gems, gold, and a lot of building materials. For those who get enjoyment out of games and don’t mind paying extra for that experience, it wasn’t a bad deal and gave a good boost. Unlock these to find treasures, if you can manage the wait time. The chests i think are the biggest issue i had stalling game play. 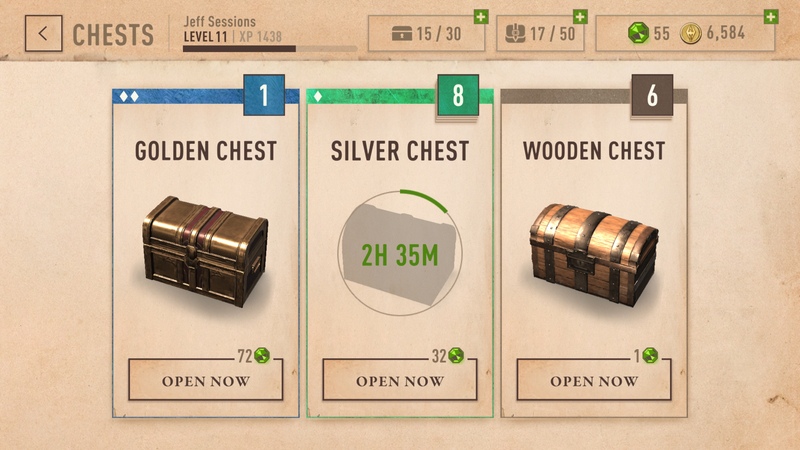 The easiest chests you find while questing will open in 5 seconds or for 1 gem, and contain generally basic items. The next step up, the silver chest, takes 3 hours to unlock or 36 gems. This chest has rarer items still. A gold chest takes 6 hours to unlock and i’ll let you know what’s in it when it finally unlocks. This wouldn’t be a problem if there wasn’t only one slot to unlock chests. The mode of financial incentive to spend is understandable, the price as of now seems a little steep. Gems are available as rewards through regular gameplay, though in small amounts only enough to speed up something a couple of minutes. 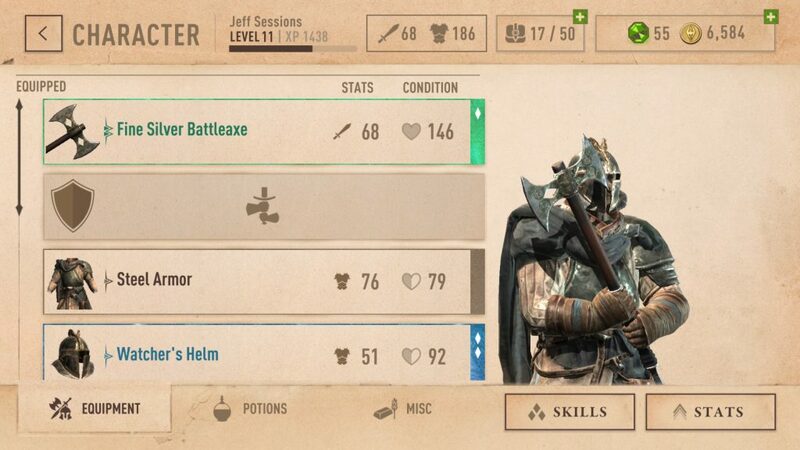 I think for a free mobile game, Bethesda has done well. There are no guilds or player connections that i’ve seen although there’s always room for a patch. The game is well rounded for being in its beta stage. Bugs were almost nonexistent, and the game only crashed twice. When it did crash, it booted quickly back up to only a second or two before it crashed. Neither of these two crashes happened during combat or an NPC sequence so i’m not sure how that situation would play out. 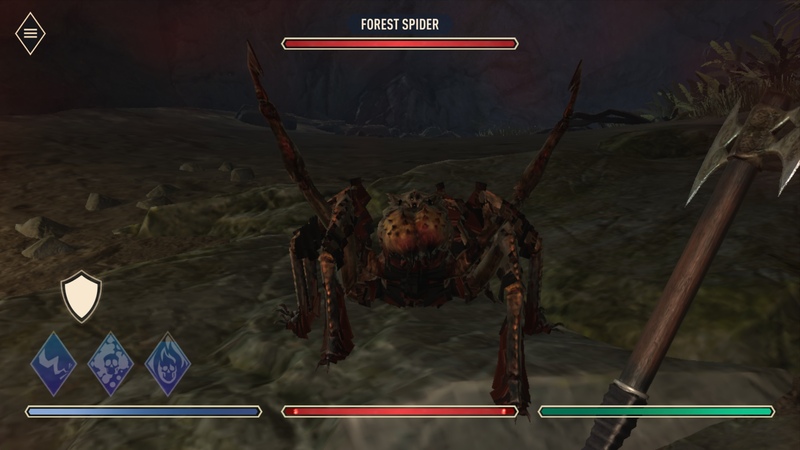 Some of the creatures seemed underpowered like skeletons and bandits, while others seemed way overpowered like the goblins in later levels. They shredded me like a failed foot clan soldier. The enemy scaling system may need some adjusting in future updates. I began playing this on my iPad and logged into it on my iPhone at work to see if the save files carried over. Low and behold, i could pick up right where i left off on my iPhone. Cross platform compatibility between android and apple, etc, remains to be seen. So does this game reconcile the past woes felt by Bethesda? In my opinion not quite, however it’s a promising step. Bethesda realized the product they had wouldn’t meet customer expectations and took a step back to retool what they had. 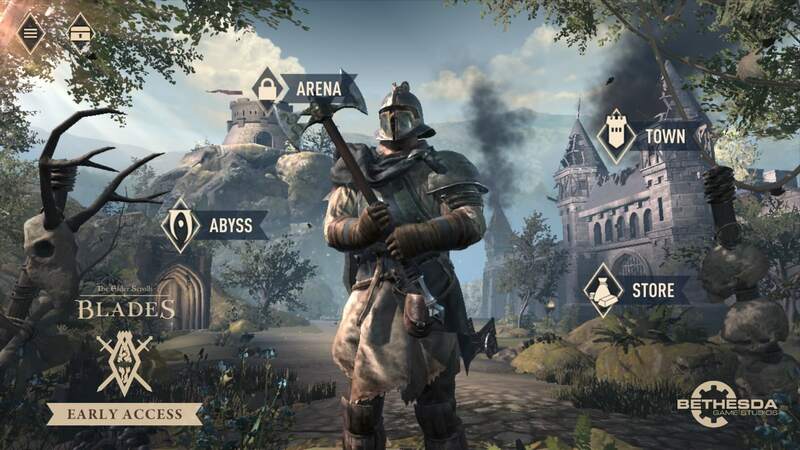 What they came up with was a good expansion on the Elder Scrolls world. Overall, i enjoyed this game. The player interface is pleasing and the music seems to be original but still reminiscent of the world it is set in. It’s not perfect but it is a step in the right direction for Bethesda.